The Australian Dingo is a medium-sized carnivorous mammal, averaging 44 cm- 63 cm at the shoulder, and weighing 13 kg– 23 kg. Males are usually larger and heavier than females. Colours vary from sandy yellow, to red ginger, with a small percentage born black-tan, cream or white. Pups are born with a black muzzle that usually fades with age. Although they appear similar to domestic dogs, there are many differences between the two. The dingo is more agile with flexible joints such as rotational wrists, flexible neck and the ability to jump, climb and dig very well making them the ultimate escape artists in captivity. Their canines are longer and sharper than that of a domestic dog to suit their wild, carnivorous diet. The dingo is an apex predator contributing to the control of many feral species that threaten Australia’s wildlife and play a very important role within the environment. They are highly adaptable animals being able to survive in most habitats as long as water is available. The dingo was a highly valued companion to the Aboriginal people who used them for warmth at night, hunting companions and even guard dogs. Numbers in the wild have declined over the years, with the main causes being interbreeding with domestic dogs as well as being shot, trapped or baited by those who believe the dingo is a threat to their livestock. Dingoes are not dogs. They are anatomically and behaviourally different﻿, and are classed as a unique species called Canis dingo. Dingoes do not bark like a dog but howl, chortle, yelp, whine, growl, chatter, snort, cough and purr. Dingoes have a broad diet including fresh meat, fish, eggs and carrion. Dingoes have a strict social hierarchy and regularly mate for life. Female dingoes have one annual breeding cycle, March to June. As a natural predator, dingoes lack body odour. Dingoes have no natural health issues and are immune to paralysis ticks. Dingoes are far more flexible in limb and hip movement than dogs. They can rotate their wrists and subluxate their hips. These adaptions aid hunting and moving through burrows. A dingo’s skull is the broadest part of its anatomy. This assures the dingo that its body will follow its head through any obstacle, no matter how tight the squeeze! Dingoes have much larger canine teeth than dogs. Males participate in weaning and teaching of young. Dingoes can run 60km/hour, travel 40km a day, jump two metres high and successfully climb trees. Dingoes are driven by nature’s survival instincts: hunting, procreation, protection of territory and family. 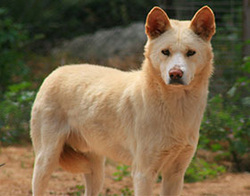 double coat that is shed in the summer months, while dingoes in warmer areas have lighter coats. Their overall body shape is very lean, with the cheekbones being the broadest part of the animal. They have erect ears and a bushy, bottle-shaped tail. A distinguishing feature of the dingo is the jaw’s ability to open extensively wide. Teeth are large, sharp and evenly spread throughout the mouth with slight gaps between. Although dingoes have larger teeth than dogs of similar size, they do not experience dental over-crowding like their domestic counterparts. Senses of sight, hearing and smell are acute and discerning. The ears move independently of one another and can rotate to face the back of the head. Dingoes are highly flexible with the ability to rotate their wrists and subluxate their hips. Limbs are double-jointed and the neck can turn 180 degrees in any direction, a feat impossible for dogs. In addition to these unique characteristics, dingoes are excellent runners, jumpers and climbers. Dingoes have been tracked at 60km/hour and travelling forty kilometres in one day. They can bound two metres high and successfully climb trees. These traits are what make the dingo an agile predator and excellent escape artist. Within the dingo species exists a number of naturally occurring colour variations that can be found throughout Australia. The ginger variation is the most common and can be found throughout the mainland. 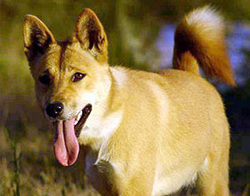 Dingoes with a sandy yellow coat are typically found along the coast, while sable and black variations are often found in heavily forested areas and account for 8% of the natural population. 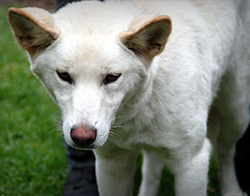 White and cream dingoes are typically found in alpine regions and account for 4% of the natural population. Sandy-yellow coat with a white under-body that often extends to the cheek. White socks and white tail tip is common. Nose and lips are regularly black. Red-ginger coat with a white under-body that often extends to the cheek. White socks and white tail tip is common. Nose and lips are regularly black. Sandy coat shadowed by a solid or broken brown-black mask. White under-body with white socks and tail tip is common. Nose and lips are regularly black. Black-chocolate coat with tan and white under-body extending to the cheek and ears. White socks is common. Nose and lips are regularly black. Cream-primrose coat which may be solid or feature lighter coloured under-body extending to cheek or muzzle. Pink nose and black lips is regular. White-ivory coat that appears solid with the exception of cream-primrose ears. Pink nose and black lips is regular. 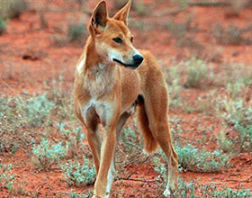 Variations in physical form exist within the natural dingo population, and seem to be dependant on local habitats and food sources. 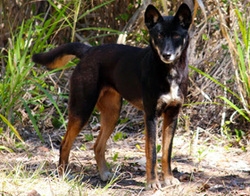 Fraser Island and coastal dingoes tend to be lean and long in the leg with larger foot pads, while Alpine varieties are often stockier with a broad, triangular head and a thick double coat. Desert and Tropical varieties are lean with narrower heads than the alpine varieties. These combinations of colour and form assists each variation in adapting to the needs and challenges of their local environments. Once believed to have been introduced to Australia by Indonesian seafarers some 4000 years ago, modern archaeological evidence now indicates that the Australian Dingo’s origins are in fact far older than originally supposed. Mitochondrial DNA data collected by scientists from The Royal Society indicates that the dingo has occupied Australia for over 18,000 years, having migrated naturally from central Asia across land bridges that joined the land masses of Australasia during the last ice age (Pleistocene Epoch 18,000BP). As a highly adaptable animal, the dingo spread to all areas of Australia except Tasmania. Their habitat was vast and expansive, including alpine, woodland, grassland, coastal, desert and tropical regions of Australia. Since European colonisation and the spread of agriculture, there has been an aggressive and consistent push to have the dingo eradicated from many parts of Australia. The dingo is now absent in areas of New South Wales, Queensland, Victoria, the lower third of South Australia and the southern part of Western Australia. The introduction of domestic dogs has seen a further decline of dingoes from the Australian landscape. Feral dogs and dingo-hybrids now inhabit what was once traditional dingo territory. 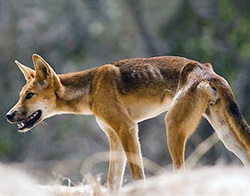 Dingoes are opportunistic carnivores and as such have a broad diet. They usually search for food alone, sometimes in pairs, and occasionally form hunting packs when in pursuit of large prey. They will naturally consume kangaroo, wallaby, possum, wombat, reptiles, birds, insects, eggs, and the remains of aquatic life when available. Their consumption of carrion significantly aids the natural ecology. Since the introduction of foreign species to Australia, the dingo’s diet has expanded to include feral animals such as rabbit, hare, goat, cat, fox and pig. In some areas of Australia, the dingo’s predation of these feral species is allowing for the regeneration of vulnerable native flora and fauna. As top predator, the dingo has an important ecological position in the preservation of Australian biodiversity. Dingoes breed once a year between the months of March and June. The female’s gestation period is 63 days, resulting in a litter of four to six pups. Usually only the pack’s alpha male and alpha female will breed, with all members of the pack helping to raise the pups in a communal effort that ensures the survival of offspring. Adult dingoes have been known to care for orphaned pups from other packs, and adopt them in to their own. Weaning of pups commences at around two months of age, and by four months juveniles begin to hunt small prey. Dingoes are fully grown at seven months, with males reaching sexual maturity at one year and females at two. As dingoes have no naturally occurring diseases and are immune to the otherwise deadly paralysis tick, they will live up to ten years in the wild and twenty years in captivity. Dingoes are highly individualistic animals, each with their own personality and tendencies. They are naturally very cautious and easily frightened, preferring to avoid unfamiliar threats than be exposed to confrontation. Dingoes are extremely sensitive to their surroundings and will take note of small changes. They adhere to a strict social hierarchy lead by an alpha pair that typically mate for life. Individuals tend to be extremely affectionate and playful toward mates, pups and fellow pack members, showcasing a range of play behaviours including jumping, body slamming, hugging, wrestling and jaw sparring. They are highly intelligent, deeply intuitive, and naturally curious and social. Packs usually consist of a breeding pair and their offspring from the current and previous year. When pups begin to mature they will leave their family to find territory and start a pack of their own. On occasion, unrelated dingoes may come together during a hunt to bring down larger prey. Dingoes display clearly defined territories in which they hunt, breed and live. Individuals live in loose groups and together hold a communal territory, which they will guard from intruding parties. Urination, defecation and scent gland markings define their pack boundaries. Territories are shared to form larger hunting packs when sizable prey is sought. Dingoes communicate through a series of vocalisations including howls, growls, chortles, yelps, whines, chatters, snorts and purrs. Dingoes can bark but do so very rarely. A dingo bark tends to be one sharp bark rather than a series of on going yaps. A sharp, low-pitched “woof” is often used as a warning sound when under threat of predators. Mothers will use this sound to call cubs back to the den if she suspects danger is approaching. Body language is also used as a main form of communication using movements in the ears, eyes, mouth, tail and head to interact with one another. Tall, erect body postures may be used to express dominance or arousal, where as flat, low to the ground gestures may communicate fear or submission. Bonded breeding pairs may also be seen grooming one another or performing a range of courting behaviours during breeding season, including females spinning and flicking their tails, taking turns in dominant wrestling, whining and purring, exchange of food, and brushing up against one another's bodies. Many threats exist for the conservation of the pure dingo in Australia. These include continuous baiting, trapping, organised culling, hunting, 'wild dog' fencing, and contact with the domestic dog, Canis lupus familiaris. The spread of urban settlement throughout Australia has increased interbreeding between the two species. This is leading to the dilution of the dingo gene pool and quite possibly the ultimate extinction of the Dingo subspecies. The Dingo has been listed as 'vulnerable' by the International Union for the Conservation of Nature and Natural Resources (ICUN).